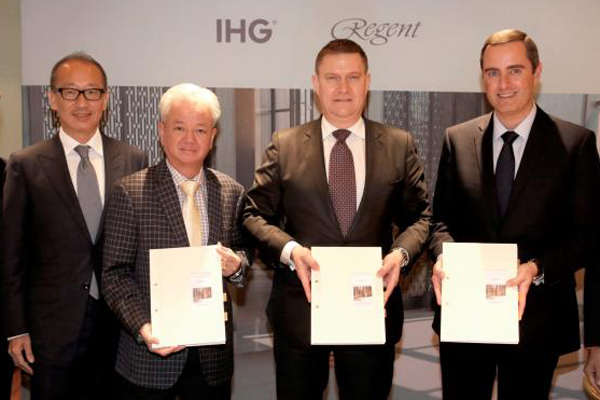 InterContinental Hotels Group (IHG) has announced a signing for its Regent Hotels & Resorts brand in Kuala Lumpur, Malaysia, alongside its relaunch of the brand that set the standard for luxury hotels. IHG announced the acquisition of a majority stake in Regent Hotels & Resorts in March, bringing the much-loved brand into the top end of its portfolio, and increasing IHG’s presence in a fast-growing luxury segment worth $60 billion. IHG has worked quickly to combine its expertise in luxury with Regent’s deep heritage and revered legacy, and through consumer research and feedback from owners and industry experts, has evolved the brand to appeal to the modern luxury traveller. Keith Barr, chief executive officer, IHG, commented: “I’m delighted that we’re announcing the first signing for our Regent brand today. I’m confident that our impressive new positioning and brand identity will allow us to continue to take the brand to the world’s best destinations and help position Regent as a real leader within luxury hospitality." "We are already one of the world leaders in luxury with our InterContinental Hotels & Resorts brand, and alongside Regent and Kimpton, we have significant potential to expand our global footprint in the fast-growing luxury segment,” he said. The signing announced is with Multibay Development Sdn. Bhd for Regent Kuala Lumpur. Regent Kuala Lumpur will be situated next to Tun Razak Exchange project which is set to become the next financial district of Kuala Lumpur and an extension to the city’s golden triangle known for its commercial, shopping and entertainment options. A 45-minute drive from Kuala Lumpur International Airport, Regent Kuala Lumpur will be the luxury address in Malaysia’s capital.